A love story with Kashmir as the backdrop sounds interesting. War films are tough nuts to crack. 'Yahaan' is a love story between an army man and a local girl set in the troubled valley of Kashmir. 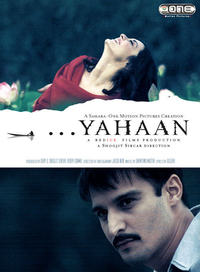 Directed by adman Shoojit Sircar who debuts as a movie director, 'Yahaan' could have been an engrossing tale but due to intermittent slackening of pace, some loose editing and story not moving forward at a few places, the impact gets diluted in an otherwise well shot film.